Are you passionate about apologetics? Come serve with our team as Josh shares how to live, defend & share the Christian faith. It starts with our leadership. Our CEO, travels the world to fulfill our mission of serving others until the whole world hears about Jesus. To assist him, we’re looking for an individual just as passionate about serving others—one with an interest in and sensitivity to people and detail. In addition, you will also assist other executives. Document meetings, record keeping, composing documents, word processing, reporting, tracking, internal communication, filing and small project management. The Curriculum Development Internship serves a dual purpose, giving the intern valuable experience, while lightening the workload of the Development team by assisting them in program development and alignment with curriculum needs. A Curriculum Development Intern should have a desire to see the Gospel shared around the globe and to be a part of a team passionate about partnering with others to accomplish this goal. Support the Wholeness Initiative with skills in interacting and promotion online. You’ll be one of the online voices of the initiative, mixing professional customer service know-how with technical, primarily on our social media platforms (Facebook, Twitter, Instagram). Do have you passion for seeing others find wholeness out of woundedness? Support the Wholeness Initiative with skills in scheduling, travel planning, documenting meetings, record keeping, composing documents, word processing, reporting, tracking, internal communication, filing and small project management. Do you like making connections? Do you have an interests in PR and communications? Come serve with Josh for a year and see what it takes behind the scenes to run events globally. Follow up with Event Attendees & Hosts. If you enjoy helping colleagues with technology, feel called to a fast-paced ministry and have a background in information technology, you will enjoy serving with us in this position. Just be prepared to buckle your seatbelt and enjoy working with the latest technologies available! As a Media Specialist you will use your knowledge and experience in web development (computer programming, web design) and graphical communication (images, videos, audio) in the production of websites (primarily) but not limited to -- apps and other interactive projects. You should understand customer experiences and be able to employ new and existing content along those paths. Do you like to travel? Have you ever wondered what it would be like to spread God’s word to audiences hungry for truth? 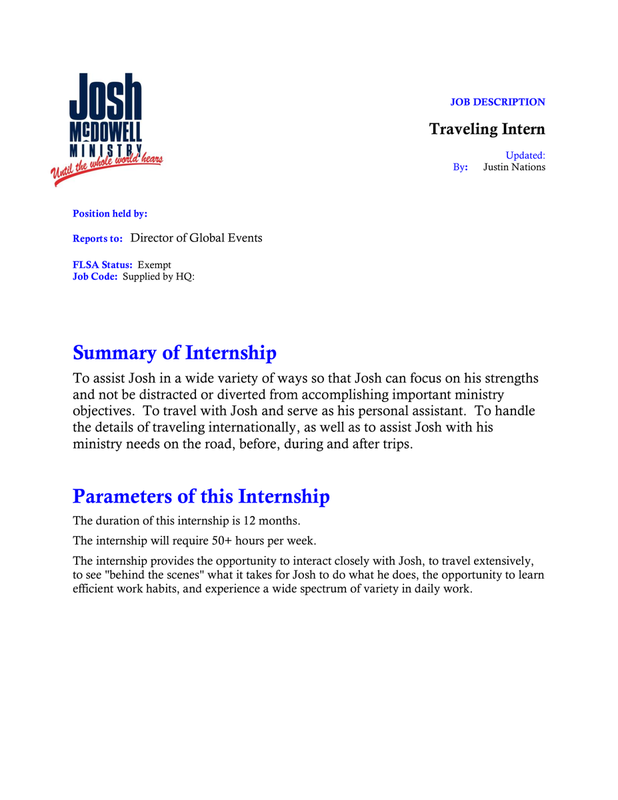 Come travel with Josh for a year and see for yourself! Serve as Josh’s right hand person on the road. Run the presentations behind the scenes. Handle the details of traveling and interacting with host. We have a library full of powerful images waiting to be used as well as an abundance of live events and messages coming up that need to be captured creatively and communicated electronically. If you have an eye for dynamic visual presentations and embrace a vision of true followers of Jesus everywhere who live, defend and share their faith, then Josh McDowell Ministry is the place for you! Interns serve for 12 months. An intern may choose to serve a second year but cannot serve for more than 24 months. At this point, an individual would need to choose between joining Cru in another capacity (such as Full-time staff, Part-time, Volunteer) or other opportunities. When does the internship start and end? We are continually looking for interns. The internship is for one year. How much support will I have to raise? Living expenses vary by each persons particular needs. Will I get any training in how to raise my support? Our interns attend a required Intern Kick‐off Weekend conference that orients them to the process of raising support. After attending the conference, you have the tools needed to begin raising your support and have the next 3‐4 months to raise it. All applications are submitted online at https://apply.cru.org. When prompted to designate preferred ministry, select “Other Ministry” then select “Josh McDowell Ministry”. When is the deadline to apply for an internship that will start next September? March 1 is the deadline for receiving your completed application, including completed references. What are the qualifications for serving as a Cru Staff? My parents have a lot of questions; do you have any resources for them? Many parents have concerns about the future career with Cru that their son or daughter might be considering. We hope to answer some of your questions and give you a clearer picture of who we are and what we do.